The World Conference on Ecological Restoration takes place in Iguazu Falls, Brazil. In anticipation of the conference, we spoke with experts on restoration taking place right nearby in Brazil—how it benefits the planet, how farmers can make money in restoration and how enterprises are putting a particularly Brazilian spin on the project. Can we be the first generation in modern human history to leave the planet better than we found it, while growing economically? The answer is "Yes!" according to Sean De Witt, director of WRI's Global Restoration Initiative, and Miguel Calmon, WRI Brasil director of forests. The key, they say, is landscape restoration, a topic they discuss with Lawrence MacDonald in a new WRI Podcast. Restoration is the process of reintroducing trees and shrubs to degraded and deforested landscapes to benefit the environment, economy and people. Trees improve water and soil quality; they also promote food security, generate income and jobs, and provide biomass for clean energy. "Restoration is about trying to harness what trees do really well," Sean says. How to make restoration attractive to landowners, farmers or institutional investors? "If you really expect a farmer to invest his or her time putting trees in the ground, we should be able to come up with a nice way for them to make money out of that," notes Miguel. This is the inspiration behind VERENA, a WRI Brasil project that is demonstrating the economic viability of using Brazilian native species in large scale reforestation. Brazil has pledged to restore 12 million hectares (30 million acres) of forest by 2030. That's more than a third of the 30 million hectares (74 million acres) of Brazilian forests that have been degraded and deforested—an area roughly the size of Italy. Native trees are rarely planted, although there are about 100 high-value native tree species to choose from. "Native trees can really improve those lands by generating income, for the country and for farmers, and can even help in addressing climate change," Miguel says. VERENA, now in its second year, is proving that farmers can make sizable profits planting native species. Miguel says they stand to make more money with native species than with the more commonly-planted exotic species, such as eucalyptus and pine. By documenting successful businesses, VERENA is demonstrating that restoring productivity and biodiversity to degraded landscapes offers long-term investors, landowners and farmers attractive returns. Restoring native species, some of which have been logged nearly to extinction, also restores local pride and forest knowledge, what Sean calls "cultural restoration." Symbiosis Investimentos, a reforestation company set up in 2008 by former banker Bruno Mariani, is one example of success. Seeking to meet high demand for wood products without disrupting ecosystems, the company planted a degraded pilot of 1,500 hectares (3,707 acres) with 22 high-value Atlantic rainforest trees. Seven years on the trees are thriving and three external auditors have endorsed plans to expand. 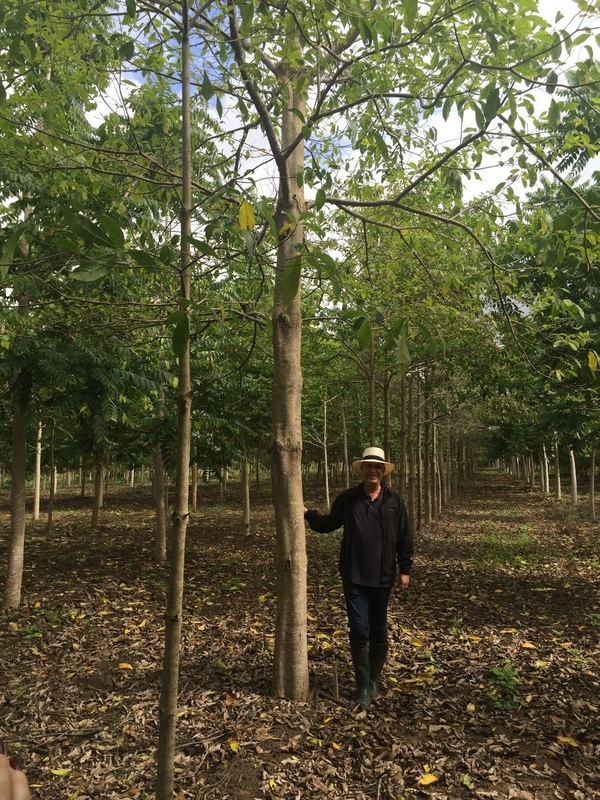 A three-and-a-half-year-old Louro Pardo (Cordia trichotoma) tree, Symbiosis farm, state of Bahia, Brazil. Photo credit: Miguel Calmon. Miguel, who recently visited the pilot plot, says that the native trees are growing fast, promising relatively quick returns on investment. To take such success to a national scale will require government support for a native tree revolution, including access to finance and markets, seed propagation, and product research and development, Sean says. Private investors are eager to participate. Across Latin America, 19 impact investors have earmarked more than $1.5 billion in commitments to Initiative 20x20, the regional restoration initiative. Miguel's enthusiasm is infectious. "We want to be part of the new restoration generation," he says.